Monday, 10 December 2018, 7:30a.m. I have three names for you: Cameron Bagrie, Stephen Barclay and Gareth Kiernan. All three have problems with KiwiBuild. We, of course, have had problems with KiwiBuild for a year now, because it would have appeared relatively clear that the whole idea was hopelessly flawed from the start. But a year in, we are now seeing the growing queue of people who are looking on with increasing alarm. 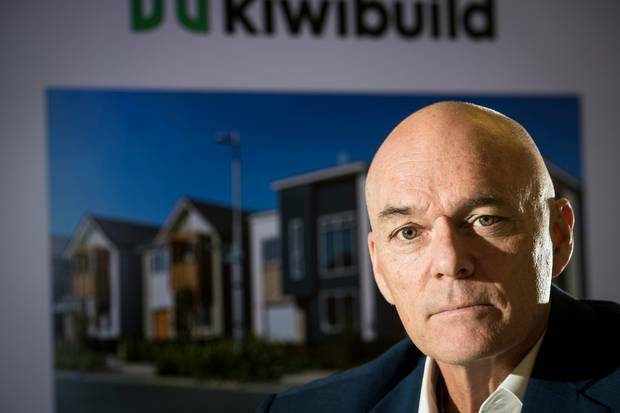 Stephen Barclay is the boss of KiwiBuild. He's gone. After five full months in the job, gone. Was he pushed? Or did he see what we see and is running for his life? Who knows? But it doesn't really matter. What matters is the boss of the biggest spend this Government has is out, after only five months. What does that tell you? Kiwibuild chief executive Stephen Barclay. Photo / File. Cameron Bagrie, the economist, says he's surprised. Not that there have been issues, because this is a big policy, but how the problems are more than just teething. And in that he is right: they're fundamental. He is surprised at the extent of the issues. He has, perhaps, seen what we have seen, the fact the houses aren't for those locked out of the market, they're for doctors. The houses are more expensive than some next door on the open market. The houses aren't being picked up in ballots, and are on the open market as a result. The houses are one bedroom and no one wants them. The houses aren't adding to the supply in anywhere near the way the Government said they would. Two-thirds of people who are first home buyers don't have an income to be able to afford them; the rules have been changed so you can flip them and make profit. I'm assuming those are the issues he's surprised about. And Gareth Kiernan, of Infometrics, he's worried about demand. Not so much in Auckland, although he should be given last week's revelations about the Onehunga properties that no one wants. All supply, no demand. But he's worried about the houses in other areas of the country, like Wanaka, where the ballot was extended because no one lined up. Marfell, in New Plymouth, where the price of a KiwiBuild house could be up to $150,000 higher than the median in the suburb. So two economists, people who know numbers, trends, supply, and demand, looking at a multi-billion dollar folly and just a year in to what on paper is a 10-year extravaganza, are expressing surprise, if not concern. And Mr Barclay, a CEO five months in the job who it seems is gone either because the Government are panicking at all this, or is gone because he was panicking at all this and bailed. This whole policy was conceived bad, born bad, and is bad. And now there are a growing chorus of observers waving red flags at Minister for Housing and Urban Development and Transport Phil Twyford, who surely must be by now, in his quiet moments at least, having reservations, if not nightmares.